Pruning strikes fear or at least intimidation into the heart of every gardener, except for the most experienced. My Webster’s Paperback Dictionary, 1996 Edition, defines pruning as “to cut or trim parts (a plant or tree) and to remove unnecessary or unwanted parts.” We know to remove the dead and damaged parts, and that pruning can increase flower and fruit production, and if done correctly pruning can improve the shape of a plant. But can I learn to prune fearlessly?? Have no fear, Lee Reich is back with his revised and updated book entitled The Pruning Book. Lee tells us there are 3 keys to pruning: “Our cuts should be well reasoned, well timed, and well made.” This book covers only pruning, so everything you have ever needed to know about pruning will be in this book. It includes how to prune shrubs, trees (young or old), hedges, vines, and house plants; also specialized pruning techniques for bonsai, espalier, and even lawn mowing is spelled out here. 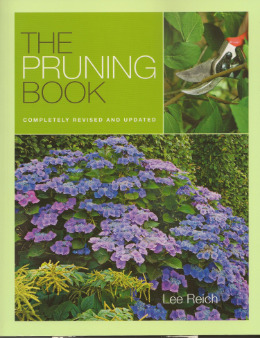 With detailed tips, tricks, and loads of advice, not to mention over 350 photos and drawings, this 2010 edition is the definitive reference guide for pruning. The book is divided into two parts. Part 1 is for all levels of gardeners and non-gardeners, and covers the basics of how plants benefit from pruning, what tools are used, where and when to make cuts, and how plants respond to various pruning cuts. Part 2 covers specific plants. Plants are grouped into categories, with similar pruning procedures to be used for any plant in that group. And yes, I had this book in my left hand opened to Chapter 8 (Edible Fruits & Nuts) with my hand shears in my right hand this spring as I worked on pruning my Plum tree. It’s not perfect, but it’s a good start. The truth is, everything I pruned this spring is now taller, wider, and healthier than before I pruned. Why have I been so afraid to prune? Let me finish this review with Lee’s words: “Couple your pruning tool with a keen eye. Close observation on how a plant grows and how it responds to your cuts makes for better – and the most satisfying – results.” What I have done so far is looking good. Now I’m working on being fearless!